There are some well known Orwell names in this Will. The Merry family was a very extensive one (well over a hundred baptisms since records began) and it continued in Orwell until the 20th century, while the Christian name Chandler (no doubt the surname of someone who married into the Merry family) was used up to 1884, when the last Chandler Merry was buried. The name still can be seen as the name of 'Chan's Barn,' in the High Street. There is no mention of any land or property, although Richard called himself 'husbandman,' and the family owned land as shown on the 1686 map, and also had a house (now no. 55 High Street) until well after the date of this will. It must be that the inheritance of the land passed under the manorial copyhold rules of the time, and so was not mentioned in the will itself. Nor was there any mention of Richard's Wife Alice, because she died in 1740, less than a month after the death of her new born son Thomas.There is no marriage record in Orwell Parish Registers, so it is probable that Richard married someone in another village. Chandler was born in 1734, and John in 1735. Chandler was only twelve when his father died, and so could not be permitted to prove the will and administer the estate. There is an endorsement (i.e. a note is written on the back) that Letters of Administration was granted to Chandler's Guardian, John Adams. This was sworn before Richard Walker, DD. The Testator's signature is extremely shaky, but is nevertheless the hand of someone who was familiar with writing, so it is apparent that he was very very feeble at the time of the Will. In fact, he died the next day. The witnesses, Prime, Lunnis, and Barton, are all names which were in the village for many years. 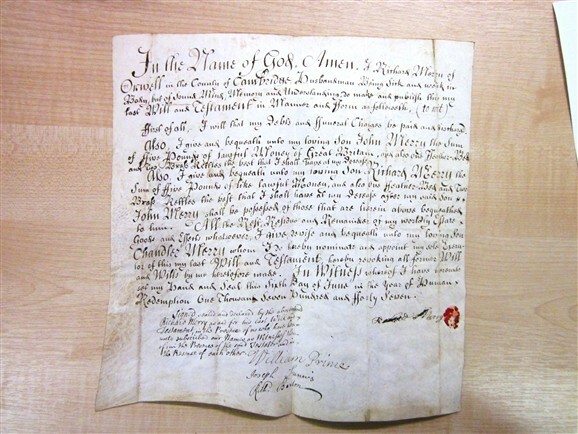 The paragraph under which the witnesses signed is in the modern form, still in use today, which states that the testator and the witnesses were all present at the same time when the will was signed. This must have been at the time a recently introduced legal requirement. 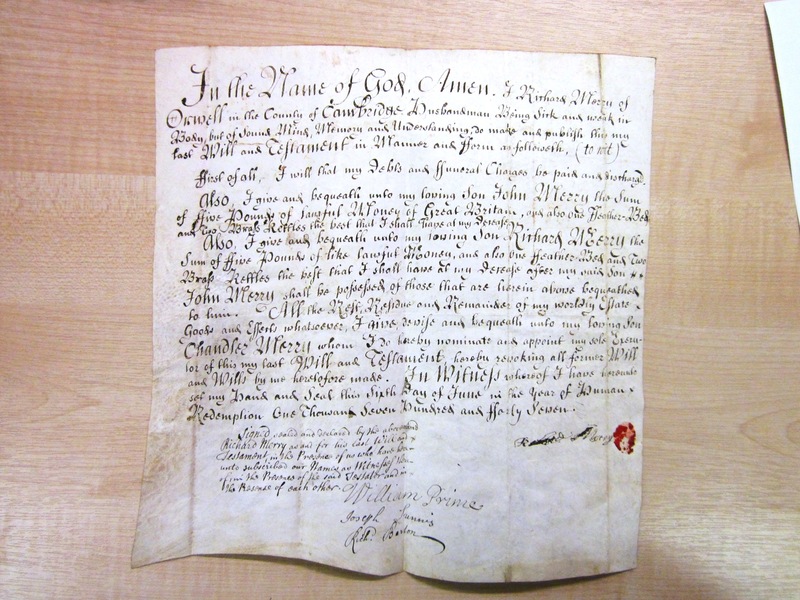 Transcription of the Will of Richard Merry 1747. First of all, I will that my Debts and Funeral Charges be paid and discharged. Also, I give and bequeath unto my loving Son John Merry the sum of Five pounds of lawful Money of Great Britain, and also one Feather Bed and two Brass Kettles the best that I shall have at my Decease. Also, I give and bequeath unto my loving Son Richard Merry the sum of Five Pounds of like lawful money, and also one Feather Bed and two brass kettles the best that I shall have at my decease after my said son John Merry shall be possessed of those that are herein above bequeathed to him. All the Rest, Residue and Remainder of my Worldly Estate Goods and Effects whatsoever, I give, devise and bequeath unto my loving Son Chandler Merry whom I hereby nominate and appoint my sole Executor of this my last Will and Testament, hereby revoking all former Will and Wills by me heretofore made. In Witness whereof I have hereunto set my hand and seal this Sixth Day of June in the year of Human Redemption One Thousand Seven Hundred and Forty Seven. This page was added by David Miller on 23/07/2013.